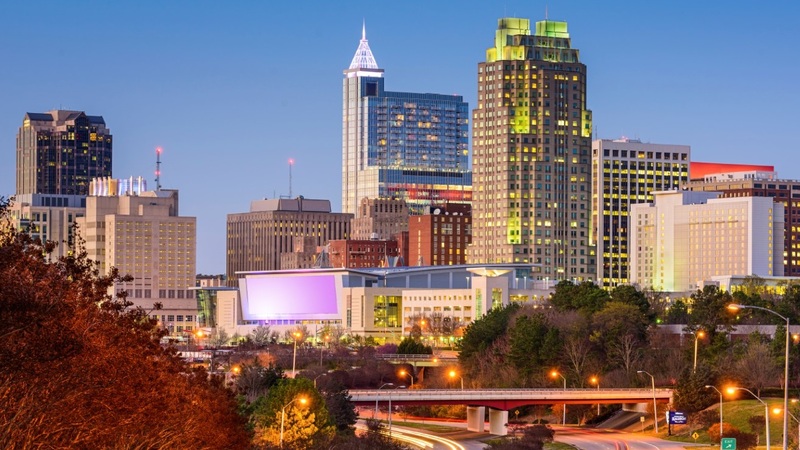 Raleigh was established as the capital city of North Carolina over two hundred years ago. The North Carolina Legislature and the North Carolina Supreme Court both sit here. The firm's offices are in the Wells Fargo Capitol Center, and look out over the grounds of the North Carolina State Capitol. The City is located just minutes from Research Triangle Park, the nation's largest planned research and development park. A number of nationally recognized companies maintain substantial presences in RTP, including Bayer, GlaxoSmithKline, IBM, Cisco, Credit Suisse, and BASF. Wake County is home to the North Carolina Museums of History, Art and Natural Sciences, and a variety of cultural and recreational opportunities including 49 major parks, three professional sports teams and seven colleges and universities. The University of North Carolina at Chapel Hill, Duke University, and North Carolina State University are close by, and form a part of the Triangle area consisting of Raleigh, Durham, and Chapel Hill. The North Carolina coast and the Blue Ridge Mountains are within easy driving distance. The population of Raleigh and Wake County has grown rapidly over recent years, and the area is now home to more than 500,000 residents. Our offices in Raleigh are located in the Wells Fargo Capitol Center, a 28-story, marble building located across from the Alexander Square Parking Deck. Parking is available in the Alexander Square Parking Deck located directly across from the Wells Fargo Capitol Building (accessible off Wilmington Street). Alternate parking is available in the Wilmington Parking Deck, which is located directly across from the Alexander Square Parking Deck (accessible off Wilmington Street or Blount Street). Travel east on Interstate 40 to Exit 298-A (South Saunders Street-Downtown). Turn right at end of exit ramp. Once on South Saunders, bear right when the road splits into McDowell Street. Follow McDowell Street to South Street. Turn right on South Street and proceed two blocks. Turn left onto Wilmington Street. Stay in the left lane on Wilmington Street. Cross Hargett Street, then turn left into the Alexander Square Parking Deck to park. Cross Fayetteville Street to the Wells Fargo Capitol Center building, and proceed to the second bank of elevators to go to the 17th floor. Travel west on Interstate 40 to Exit 299. Turn right at end of exit ramp onto Person Street. Turn left onto Hargett Street. Turn right onto Wilmington Street. Get in the left lane immediately and turn left into Alexander Square Parking Deck to park. Take Highway 70 East/Glenwood Avenue. Turn left onto Peace Street. Turn right onto Blount Street. Turn right onto Hargett Street. Get in the left lane immediately and turn left into Alexander Square Parking Deck. Cross Hargett Street, then turn left into the Alexander Square Parking Deck.